Gracie & Sophie Tyrrell are The Squirrel Sisters, a nickname which has stuck with them since childhood (Squirrel rhymes with their surname ‘Tyrrell’ and is much more fun to say!). Health, wellness and food has always been a passion of theirs so they started Squirrel Sisters as a blog in 2014, rapidly gained a large following and people soon connected with their mission. They turned their blog into a business and launched their snack bars in November 2015. At Squirrel Sisters they are all about making healthy, fun, delicious and satisfying snacks. The bars are award winning (2 Great Taste Awards, The Bronze Free From Award, The Veggie ‘Best Snack’), innovative in format, beautifully packaged and delicious … as well as being made with 100% natural ingredients of the highest quality. Ideal for lifestyles such as vegan, paleo, gluten and refined sugar free, and they are also 100% raw. Each bar is split into two sticks because they know how important portion control is to consumers and also want to encourage sharing! They’ve now taken sharing one step further with the recent launch of their ‘Raw Bites Share Bags’ which are perfect for sharing with friends and work colleagues (who will love you for it!). 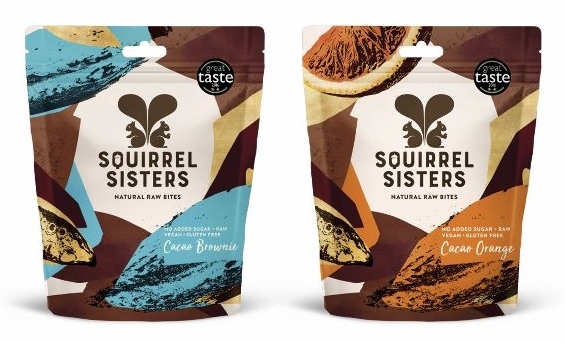 Squirrel Sisters products are currently available in Holland & Barrett, Waitrose, Ocado.com and other good food stockists which you can find here. Alternatively, you can order the products directly from the Squirrel Sisters website here.